Elder Paisios of Mount Athos (Greek: Γέρων Παΐσιος ο Αγιορείτης), born Arsenios Eznepidis (1924–1994), was a well-known Eastern Orthodox monk from Farasa, Cappadocia. He is famous for his spiritual teachings. Many people worldwide, especially in Greece and in Russia, highly venerate Elder Paisios and anticipate his formal canonization as a saint in the near future. On 25 July 1924, Arsenios Eznepidis was born in Farasa, Cappadocia, shortly before the population exchange between Greece and Turkey. Arsenios' name was given to him by St Arsenios the Cappadocian, who baptised him, named the child for himself and foretold Arsenios' monastic future. After the exchange, the Eznepidis family settled in Konitsa, Epirus. Arsenios grew up here, and after intermediate public school, he learned carpentry. During the civil war in Greece, Arsenios served as a radio operator. In 1950, this was accomplished, and he went to Mt Athos: first to Fr Kyril, the future abbot of Koutloumousiou monastery, and then to Esphigmenou Monastery (although he was not supportive of their later opposition to the Ecumenical Patriarchate). Arsenios, having been a novice for four years, was tonsured a monk and was given the name Averkios. 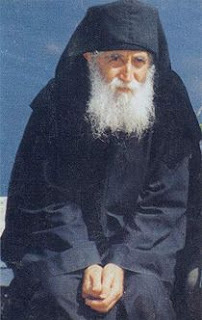 Soon after, Fr Averkios went to the (then) idiorrhythmic brotherhood of Philotheou monastery, where his uncle was a monk. While there, he was in obedience to Elder Symeon. In 1956, Elder Symeon was to tonsure Fr Averkios to the small schema, giving him the name Paisios.